Lead Photo above: Unlike ground systems, hammocks enable hiking long distances each day without sacrificing camp comfort or sleep quality. Above, the Dream Hammock Darien UL weighs just 13 oz, including bug netting, hanging hardware, gear organizer, and stuff sack. Carry heavy camp gear (e.g. plush air mattress) to improve camp comfort and sleep. I make this claim as an experienced backpacker who has happily ground-slept for decades. My motivation for hammock camping was curiosity, not dissatisfaction with ground sleeping. The more experience I acquired, however, the more obvious it became that hammocks were a more practical and efficient system, especially in the eastern US. In locations with ample trees of sufficient strength, the primary advantage of hammock camping is the huge increase in suitable campsites. In Shenandoah National Park, for example, most of the terrain is rocky and steeply sloping; the number areas suitable for ground camping (i.e. flat; and free of rocks, roots, and vegetation) is very limited. Moreover, many of these areas have developed into crowded, heavily impacted campsites. Shenandoah’s unsuitable terrain — and its overused campsites — is made completely irrelevant by a hammock, which can be setup in almost all areas of the park. So long as I can find two trees that are 12-18 feet apart, I can setup a hammock without any regard to the surface below it, even on, say, a wet and rocky 15-degree slope. With the huge increase in suitable campsites, a hammock system gives a hiking-inspired backpacker the option to hike dawn-to-dusk (or some variation thereof) without the risk of getting caught in a stretch of un-camp-able terrain. In turn, this flexibility equates to a great number of hike-able time, which ultimately equates to hiking longer distances. I believe this increase in hike-able time will typically outweigh the slight weight increase of a hammock system versus a ground system, if there even is one. A Jacks R Better bridge hammock pitched on a 15-degree hillside along the AT, hardly a suitable campsite for a conventional ground system. In a hammock, the terrain underneath has no effect on sleep quality. Many people find sleeping in a hammock more comfortable than sleeping on the ground, or at least as good. A better night of rest allows me to recover better and hike more the next day. Unlike a ground system, this increase in sleep quality is not in opposition to a lightweight pack. A hammock is also an excellent camp seat, without the need to bring a dedicated camp chair. Oftentimes I can setup a hammock faster than a ground system. When camping on the ground, I must first scope out a suitable area and then clear it of rocks and other debris. In contrast, setting up a hammock involves clipping two nylon straps around trees — a process that takes an experienced hammock camper just a minute or two. Hammocks can be consistently set up the exact same way, night after night. In contrast, the ground experience changes nearly every night due to ground sloping, ground cover, and surface abnormalities. Therefore, it’s easier to master the setup, and I can reliably sleep the same way each night. With more campsite options, hammock campers can avoid further impacting popular campsites. Hammocks do not crush or smother the plants below them. Note: To avoid impacting trees, wide tree-straps should be used. Almost all backpacking hammocks are sold with this type of strap. With greater campsite availability, I can get away from habituated camping areas to find peace and quiet, and a better night of rest. Hammocks are a blessing to those that do not desire the crowded social scene at most Appalachian Trail (AT) shelters and other popular camping areas. And when better campsites exist — more aesthetic, more protected, less buggy, etc. — I can utilize them. Many times it is faster and more convenient to camp near a water source, like if I am hiking on a ridge where water sources are sparse. With a hammock, I can camp near these water sources even if there are no suitable ground campsites nearby. When it’s raining and/or when the ground is wet, a hammock system is superb. The tarp keeps me protected against rain, and the hammock can be used as a dry bench seat while I am cooking or relaxing in camp. Many people find sleeping in a hammock far more comfortable than sleeping on the ground, regardless of the terrain underneath. In keeping with Leave No Trace principals, the hammock will leave the ground cover and leaves almost completely undisturbed. 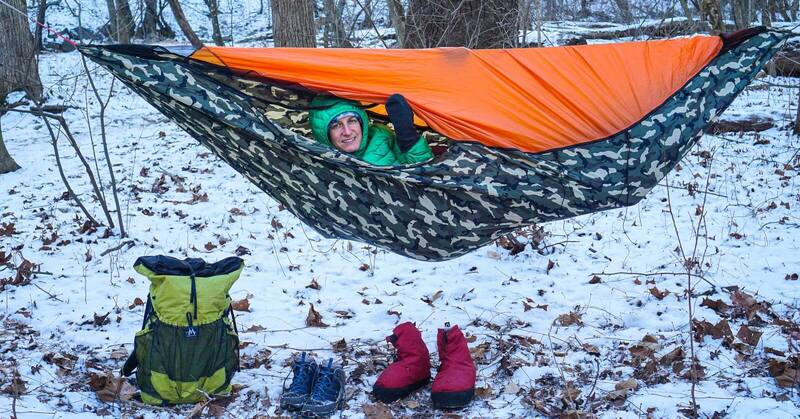 Pictured: Warbonnet Blackbird Hammock with Edge Tarp. They are designed as a 1-person shelter. 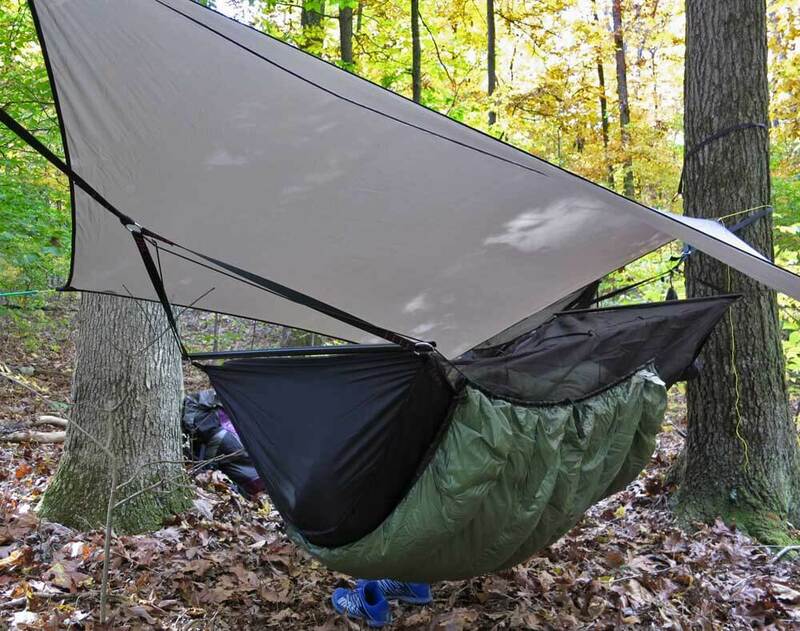 Comparing the weight of a hammock system against a ground system is difficult and complex. Both systems have several popular designs and configurations — Which systems should be compared? And how could we ensure that the systems being compared offer a comparable user experience, in terms of camp comfort, sleep quality, and environmental protections? That said, generally speaking, hammock systems are slightly heavier than the lightest ground (tent) systems. But given the aforementioned difficulties of this comparison, this slight difference is not significant enough to be a solid disadvantage for hammocks. 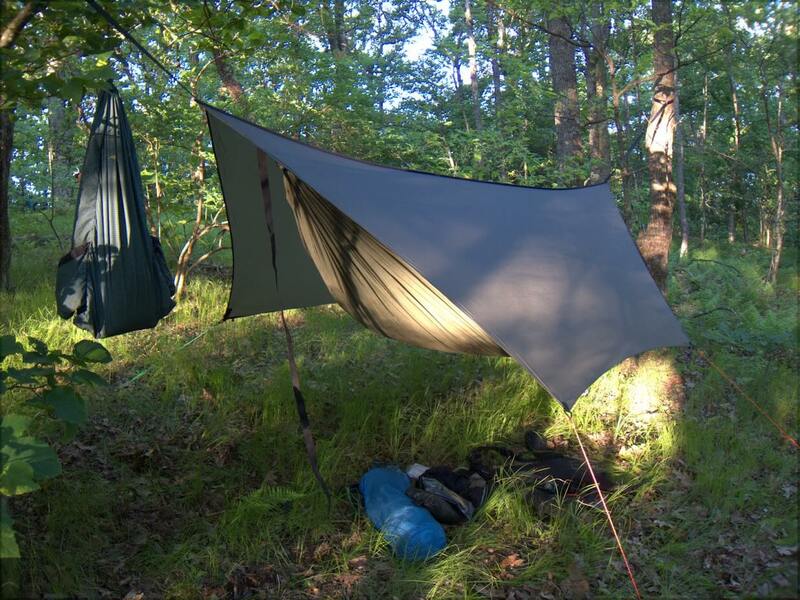 And the hammock systems that I use are far lighter than almost all conventional tent setups you’ll see on the trail. Through long association and use, most backpackers are intuitively familiar with how to setup a ground system. Not to mention that most people use a ground system at home — a standard bed. Conversely, most backpackers do not understand the first thing about backpacking hammocks. There is a bit of an art to setting up a hammock and sleeping in one. Thus, learning to hammock camp may initially take more time. As noted earlier, however, there is nothing terribly difficult about setting up a hammock, and in the long term it is probably faster to set up a hammock than a ground system. Some sleepers object to even a slight banana bend, which can be mostly but not entirely solved by a wide asymmetric hammock or by a bridge hammock. Some people feel slightly squeezed in a hammock. In general, bridge hammocks feel a bit tighter than gathered end hammocks. 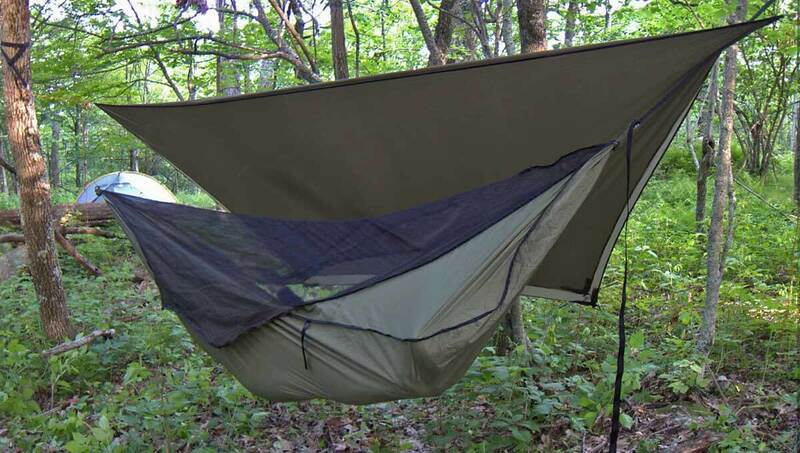 While ground sleepers need to insulate their underside (against the ground, usually through a closed-cell foam or air mattress), hammock campers are even more sensitive to cooling from underneath, especially if there is wind. Even in 60-degree temperatures, convective (air current) heat loss can be significant under a hammock. Most hammock campers will need to have effective insulation underneath their hammock, in addition to the conventional topside insulation (i.e. sleeping bag). This can be a properly installed sleeping pad, but this ground-inspired product does not translate well to hammocks, and under-quilts are widely preferred. In extreme cold temperatures, a full-sided tarp to block the wind is also very helpful. Some knowledge and skill are required to correctly use an under-quilt and to correctly pitch a tarp. Once mastered, sleeping warm presents no major difficulties. If there is any wind, a large well-pitched tarp is important to staying warm and dry in a hammock. 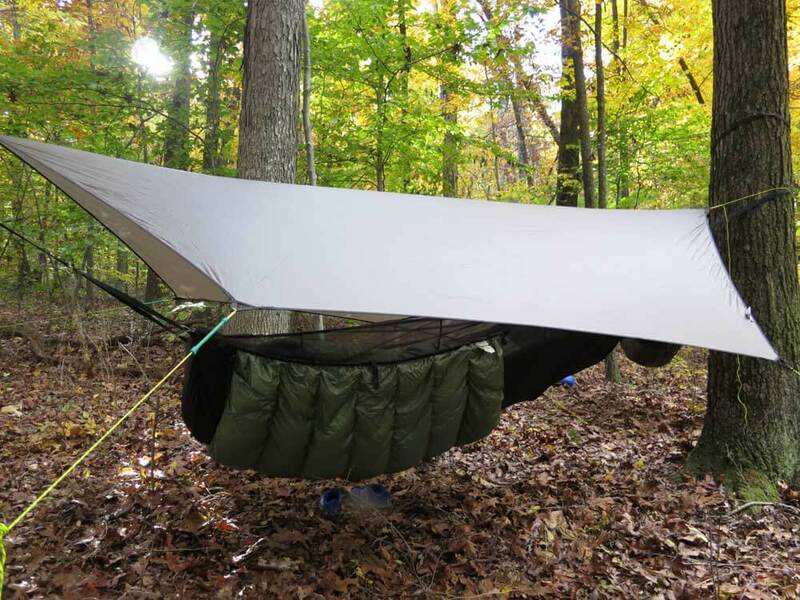 Here the large Warbonnet Edge Tarp is pitched tightly against the hammock body, thus protecting the hammock and sleeper from wind and convective heat loss. Picture by Andrew Skurka; Pisgah National Forest, NC. In less windy or rainy conditions you can use a higher and airier tarp pitch. Notice the under-quilt, which like a topside quilt will help to reduce convective heat loss. And finally, hammock camping works quite well even in in very cold weather. I’ve comfortably slept down to around 10° F in a 3 lb (1.3 kg) hammock setup (hammock, top quilt, under quilt, tarp and suspension). That’s way lighter than most tent, sleeping bag, ground pad setups! Just got back from a 3 day hike on the Ozarks Highland Trail. My Jacks R Better bridge hammock and tarp kept me mostly dry during the worst thunderstorm I’ve camped in (later review of the weather warning system reported 70 mph gusts!). The only mistake I made was pitching the tarp in a more open porch-like configuration with my poles. When the rain came in sideways I quickly remedied that by removing the poles and sliding my prusik knots tighter. Had I known the storm was coming I’d have pitched the tarp lower and closed the ends up more. 1. Replacing the jacks r better straps and using kevlar tree straps. I’d need to sew these dutch clips to the “tree”side of the strap. I still need to calculate the weight to see if these modifications are worth it but my gut says you could save a fair amount of weight. What do you think? Hi Jeff. Apologies for the late reply. Just back from a weekend of hiking in the Blue Ridge. Fall colors not quite there yet. About a week away. Anyway, a couple of thoughts. 1) Your modifications require a lot of work and some expense. Not that they are ba,d and they would likely result in some weight reductions [the Kevlar tree straps are a fairly simple/fast way to reduce a small amount of weight tho.]. But 2) I am guessing that you can likely come up with some far more time efficient ways to make much greater weight reductions in your overall kit. I would suggest you explore these areas more thoroughly before making extensive modifications to the JRB hammock (this is a mature and well thought out suspension system, and although a few oz more than it could be, is fast, easy to use and reliable). For me speed of use and reliability are highly desirable assuming they don’t come with a big weight penalty. And the std. JRB suspension is still a reasonable weight, so not a huge weight penalty. Good thoughts! Thanks for the reply and keep up the good work on this site! One other advantage of a hammock is avoiding animals. Animals can be attracted to the more popular/populated campsites because there is more potential for food to be left around. Having the ability to camp in less frequented areas can lessen the chance of encountering animals who return to where they have found food before. Ok I used it at the smoky mountains near the waterfall at site 68. Didn’t sleep well the first night with the waterfall noise and thinking about bears. Slept great the second night. Temps were in 60’s at night and I was toasty warm with 35 degree NF hightail 2S down bag laid out quilt style and xlite neoair long underneath. Tried once at Hoosier national forest without neoair underneath and was cold even in warm weather. No I was plenty warm with the neoair underneath me. I was only cold when I tried to use a thermal blanket under me. Didn’t work at all. That was even in fairly warm weather. I’ve just picked up the warbonnet XLC blackbird. Have only set up in backyard, but once inside I almost felt I could fall asleep right then. Footbox feature is nice, as well as the shelf feature. My daughter liked the two side tie outs as they keep the hammock from swaying very much. I’ll let you know after I’ve tried it on the trail.